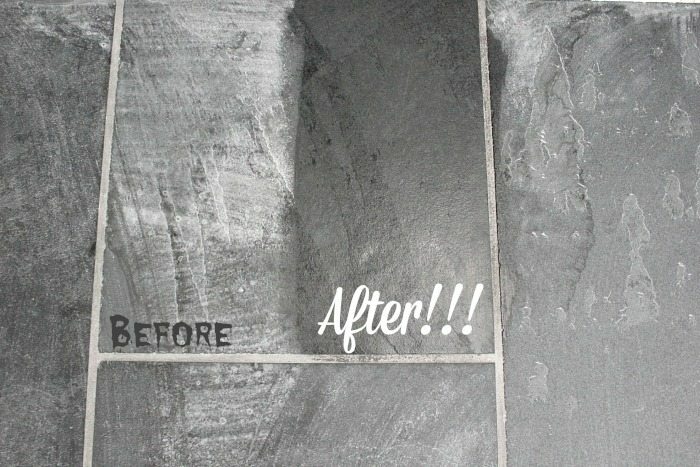 How to Get Rid of Leftover Grout Haze Quickly and Easily! Knowing how to remove grout haze will make finishing up any tiling project so much easier. Here’s a simple trick to get it done that really works! I really do love a good DIY tiling project. You can create such a beautiful effect in your home and it’s really not that hard once you get started! The thing that drives me nuts though, is that grout haze that you have to clean away at the end of a project. You’re all excited to see how your tiles look and you can’t see a darn thing because of all that dusty residue that just won’t. come. clean. 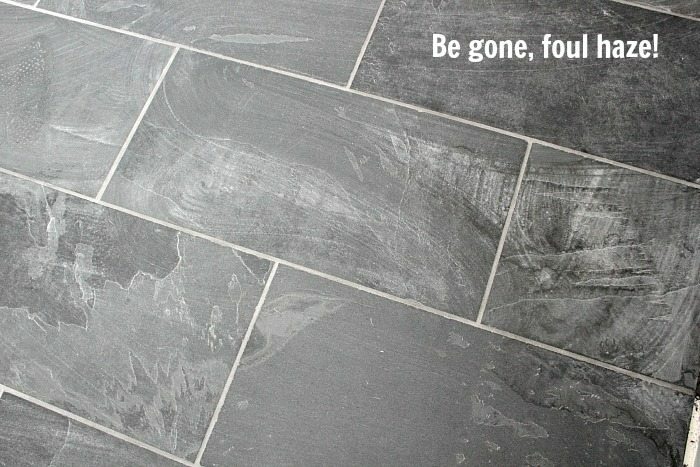 If you need to know how to remove grout haze, read on! We’ve been working in the bathroom and after we grouted the floor a couple of weeks ago, we had grout haze and we had it bad. After about a bazillion mopping attempts, (and yes, I did it the right way!) there was still a really significant amout of unpleasantness happening, so I had to do some experimenting. I’ve got the results for you today! What I’m showing you here is how it looked after Chris cleaned it really well quite a few times. Then I came in with my special mopping technique and pulled up a whole bunch more of the haze. Believe it or not, it really did look much better than it did before, but as you can tell, this wasn’t the usual floor dirt that we were dealing with, so we needed to try something a little different. Here’s the method we used to get rid of that grout haze. It worked like a charm! First, I got a dry sponge. I used one of the sponges that you can find in the tiling section. It had a softer side and a side that was a bit rougher. I used the rougher side to basically sand away most of the grout. You need to do this dry, because if you wet the surface, the grout dust will just re-stick itself. Also, make sure you’re using something abrasive-but-not-that abrasive like the sponge. Sandpaper or even those green pot scrubbers will be too rough and will scratch the surface of your tile, even if you have really raw stone tile like we have. 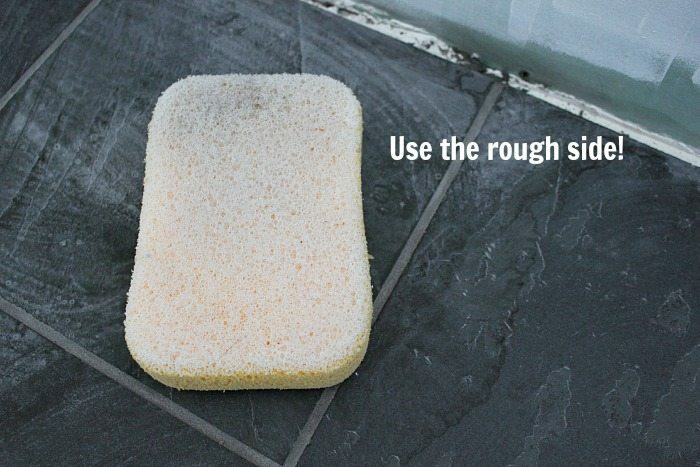 The sponge should be gentle enough to use on even a glossy tile. Test it first though in case you have some incredibly delicate tiles! After sanding, take your vacuum and clean up the dust really really well! This will make a really big difference and you will see that most of your streaks and blotches are gone just from doing this, but now here’s my magic final step! Not too shabby at all, right? I’m noticing now in the picture that there was still a bit of dampness on the grout when I took this and it looks darker on my test patch there, but the grout dried back to its normal color just fine. I love that tile! And baby wipes… who knew! I am jonesing to retile our bathroom … I’ve socked this away on Pinterest so I can use this tip!! Yay! Tiling is seriously one of my favorite DIY projects. It’s so rewarding and makes you feel so skilled! Baby wipes?! You’re kidding me. 🙂 We had this same problem when we tiled our kitchen floor. It was spotty haze in different places on the floor. After we had tried some of that store bought commercial grade haze remover(that didn’t work) I just sat there. Finally, I prayed for an “easy” solution…vinegar. Straight distilled vinegar took it off easily with some help with a toothbrush. 😉 I will definitely try baby wipes next time!! What brand did you use? Thanks for the idea! Hi Jennifer! I just used generic store brand baby wipes and they really did the trick! The gentle “sanding” with the sponge beforehand though was definitely a necessary step to get all that stuck on haze up. I’m not surprised vinegar worked too though! That stuff is good for everything! 🙂 Thanks so much for sharing! We should ask everyone what they use baby wipes for. I use them for cleaning spots and smudges from painted walls, door facings and switchplates. They’re good for so many things aren’t they? I find myself reaching for them to clean all kinds of stuff because we just happen to have packs of them all over the house right now! We have a porcelain tile floor in a large room that gets lots of use. I tried EVERything I could think of or p;iurchase to get the grout haxe off of it to no avail. That has been 7 years ago now. I look forward to trying hour method. I would not have thought of Baby Wipes! Now I’m thinking of all sorts of uses for them. my sister has recently bought herself a new house, and i have been doing quite alot of jobs in the house for her, one job i have done is tiling the kitchen floor, which is now covered in haze which no matter what i try it will not go away, so thank you very much for your tip, i will try it tomorrow. I tried your methods and they worked like magic! Thanks so much for taking the time to post this. It was so much easier to clean up and saved time in the whole process. Yay! Thanks so much for letting me know, Erin! I’m so glad I could help! We have done multiple tiling jobs here and I’ve never had a problem with ‘grout haze’……? but we wash the floor with those large sponges you showed in the picture, several times, an hour or two after we finish the grouting…..would that make a difference? Cleaning it up right away? Cuz we sure have never dealt with grout haze. Cleaning it up right away definitely makes a difference, but I think the biggest factor is probably what kind of tile you’re using. Grout haze isn’t really an issue for normal glazed ceramic tiles, but if you have a darker, kind of rustic natural stone like our bathroom floors, then that grout just holds on and won’t let go! I find the same thing….when I tile I wash, wash, wash before the haze can set up. Lots of clean, hot water in buckets. However…wipes may make it go faster! I am going to try them next time. I’m with Theresa: Let’s all tell our favorite use for wipes! They are the first thing I buy for a road trip! I always keep them handy. AND no, we don’t have small children, the youngest grandchild is 6. Brilliant! 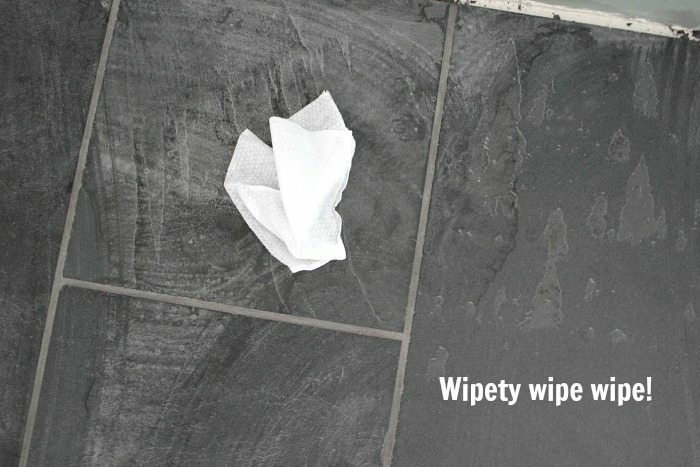 I’m so glad I found this site – the baby wipes saved me HOURS of washing, scrubbing and cussing! Those are the exact same tiles I have and it worked! We just put down ceramic tile and now need to remove the haze. Do you know if we should seal the grout before we clean the haze off. We are going to use the vinegar water method. Baby wipes have oils in them (also acids). As a tile professional, I would recommend a little patience over a very temporary issue. Especially if the tile is any type of natural stone. The oils have a tendency to darken and bring out color. Hence, uneven coloration. You must give the same consideration of getting oils on your new grout. We all love great hacks, but I have to stick to my guns on this one. Patience is a virtue! 🙂 Happy tiling. I would be remiss without giving proper guidelines about cleanup. After the grout had dried after about 12 hours, take a dry towel and then moderately rub the tiles of grout residue. After about 72 hours, only use water and a light soap solution to wash the tiles down. Very lightly. After a few days, take a stronger stance and use a general cleaner. 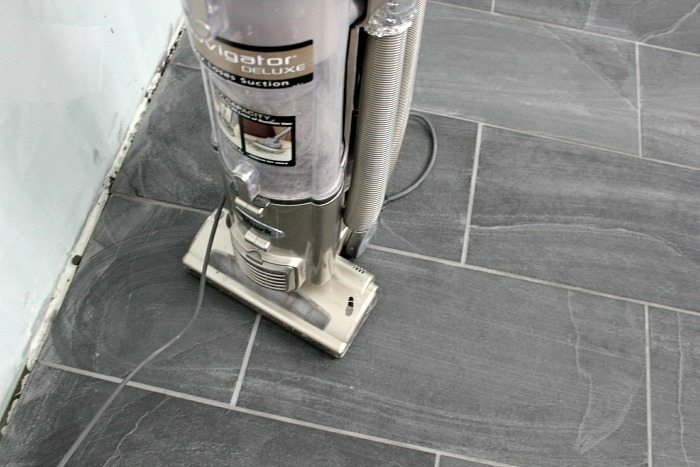 It should clean your tile to your satisfaction. Upon cleaning, then apply your grout and stone sealant. Take your time. Your tile is going to be there for a long time. No sense in making mistakes right off the bat that may cause immediate problems. Happy tiling again! Thank you thank you thank you! Although one of the previous posts said haze shouldn’t be a problem on ceramic tiles I am finding that not true in my reno. Ceramic on walls and ceiling, natural stone on floors and as decorative accents. And haze over all! I did one tile, 20 minutes it took, so I have a bench mark to test the others. So glad to read the tip of using baby wipes. I do not have the time or energy to do as suggested as I am elderly and in poor health. It took me 4 weeks to cement board, waterproof, twice, tile, grout, and now at last to seal. Once the haze is gone. So, from one old DIYer, than you thank you thank you! These are good. My husband, who lays tile, says to use a little vinegar in your rinse water. Works like a charm. GREAT suggestion. I’very been close to sick about me new beautiful haze stained floor. Grabbed a dry piece of cotton towel and SHAZAM! Baby wipes! Who knew? Wife and I have been wringing sponges all morning and our arms are tired. Found this page in a Google search. Grabbed the wipes and cleared it all off with one try. Thank you soooo much! Life saver! So glad it was helpful! We ended up using them again on our latest tiling project. It’s just so much quicker and easier! I usually wipe the tiles clean with a damp sponge over and over again, than I polish and dry the tile with cheese cloth. Normally works like a charm however, this cheaper light gray tile has been killing me with the haze I will try the baby wipes! I found my oreck stick steam cleaner did a great job!….after the initial wipe off…. Is anyone using these dangerous baby wipes on their babies?